Am I crazy to serve baguettes to French cousins? Probably, but oh well! Family dinner coming up tonight and I was asked to bring bread for the cheese course. I am bringing a loaf of my flat 4 grain bread 🙄 but since that wasn’t my best effort and my mom prefers baguettes, here they are. I used this recipe as it has been good to me in the past. Scoring could be a lot better but I am quite happy with the shape. Merci bien pour le lien! La seule critique que j’ai du film, c’est que j’ai l’impression qu’elles sont des baguettes faites à la course. Autrement, il a vraiment le tour de former et de passer son coup de couteau! Un jour peut-être j’arriverai à en faire qui ressembleront à les siennes ou en réalité à les votres! quand il a dit 'trois coute de lame', je me demande quoi ! d'habite on va donnes cinq coutes. Je vous remerci pour votre response en francais et Je regret ma francais cest la pire ! that the two at the top were the first ones shaped and they had just a few seconds more time proofing than the other two. I guess that extra minute or two really made a difference. I try to emphasize and especially if you are a sourdough baker - minutes really matter in the final stages - that why I always try to underproof just a bit - a fumble here or there without that buffer it's like dang it ! baggies you really need a good cold shaped retard in the couche, baked straight from the fridge like Don Baggs does, to be able to score them right and get the ears you want without them closing up. The taste and the crumb will still be killer though. Your family will love them I am sure. The shaping was very good from where I sit! Never thought of cold proofing them! Aren't you being adventurous! These are a bit different from your lovely cast iron pot boules, for sure, but still look very yummy. I too am contemplating baking bread for the French (Quebec) rellies coming to stay with us next week. I'm going to try making a batch of dough to keep in the fridge and bake fresh each day while they are here. Reinhart has some good recipes for that ("artisan bread every day"). 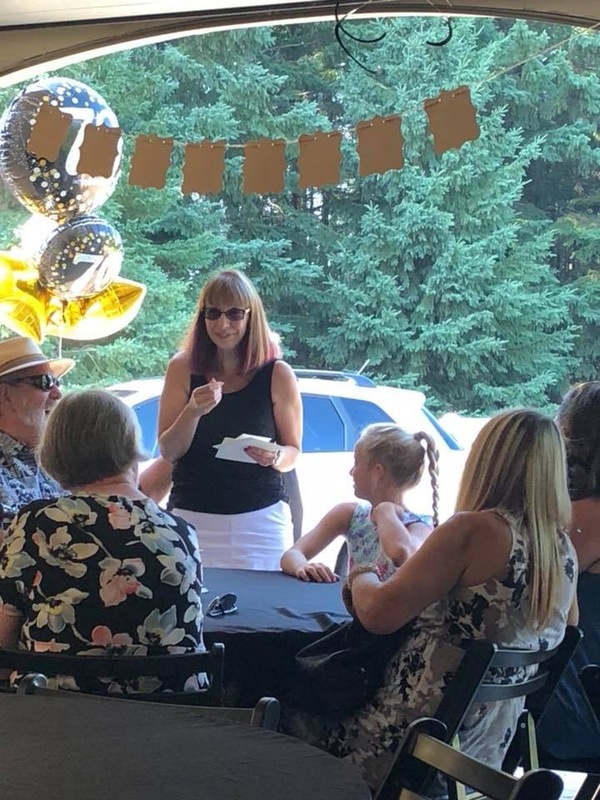 turn into a big surprise birthday party for hubby and I. I turned 60 in July and hubby will be 70 in October. Our daughter and one of my brothers organized the whole thing with his significant other. Hubby and I had no clue! The neighbours, my pottery group, friends, hubby’s coffee group plus family and the cousins from France were there! This the only picture I have of this so far. I am sorry to say that the baguettes didn’t get eaten as the whole thing was catered. I gave them away to family at the end of the night so no crumb shot. and made some baguettes. The shaping is great, and the scoring is something that comes with time. An 80% hydration baguette is a challenge, not for the faint-hearted, so brava Madame. I will tell you that you can get fantastic open crumb baguettes from much lower hydration doughs. 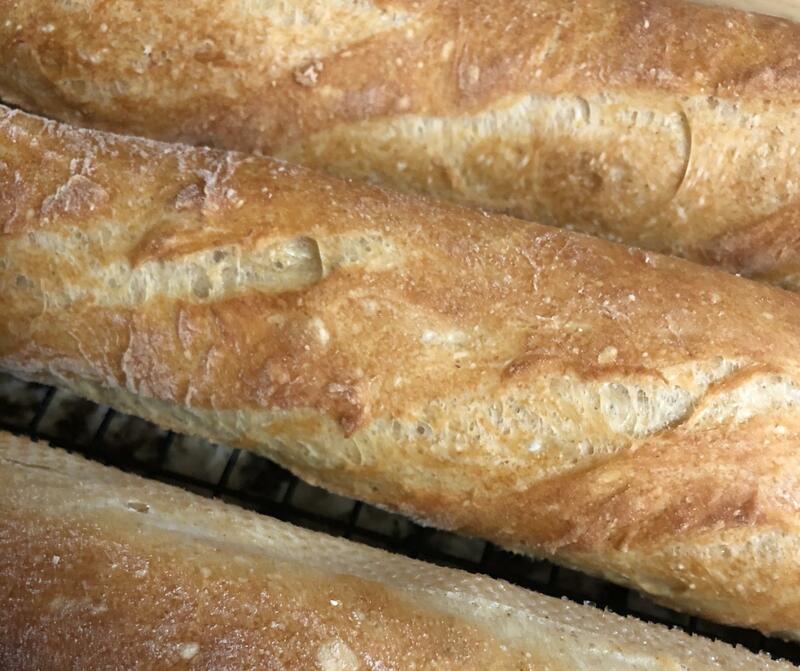 Poolish baguettes (especially with fresh cake yeast) are about as classic as they come for a "baguette tradition". However, if you wish to try these as levain breads, then a great place to start is the venerable Hamelman Vermont SD, which clocks in at around 65% hydration and can still yield an open crumb. Much less of a challenge and the results are well-worn proven to be superb. And yes, cold proofing makes scoring a simpler task in life. The mini-dimples on the underside inform us that you used one of those baguette pans. And that reminds me of Kendalm mentioning that a few years ago his wife bought him one of those. As he bakes on a stone, it wound up being a kitchen decoration for its lifespan. Happy birthday, and as you'll find out for yourself, 60 ain't so bad! Good memory Alan - although not an ornament but re-purposed as a cooling tray. Btw its 82f in my kitchen - I'm doing 29 minute final at .8% fresh stuff - the beasties are partying hard this summer ! Well, happy birthday to the two of you! I have an Italian bread pan (like the baguette pans, but a bit wider), and bake with it on the stones all the time. Turns out lovely! And it's a lot easier to cope with a wet sourdough this way when it's in a rotation of a whole lot of other breads (baking for the little bread shop on Saturday mornings). I have also used it to cold proof loaves - just cover the loaves with napkins then put the whole thing into a bag and into the fridge. Scoring and loading in the morning are a doddle! Nice baguettes and nice occasion! So, how did your your French cousins like your baguettes? I vaguely remember 60. I was so young then! Happy birthday, and happy baking! What a nice surprise that must have been. Too bad we didn't get to see the crumb, but I'm sure they turned out great. Now you need to make another batch, trying the cold retarding per DA and see how the scoring comes out and the crumb :). I really should make baguettes more often. 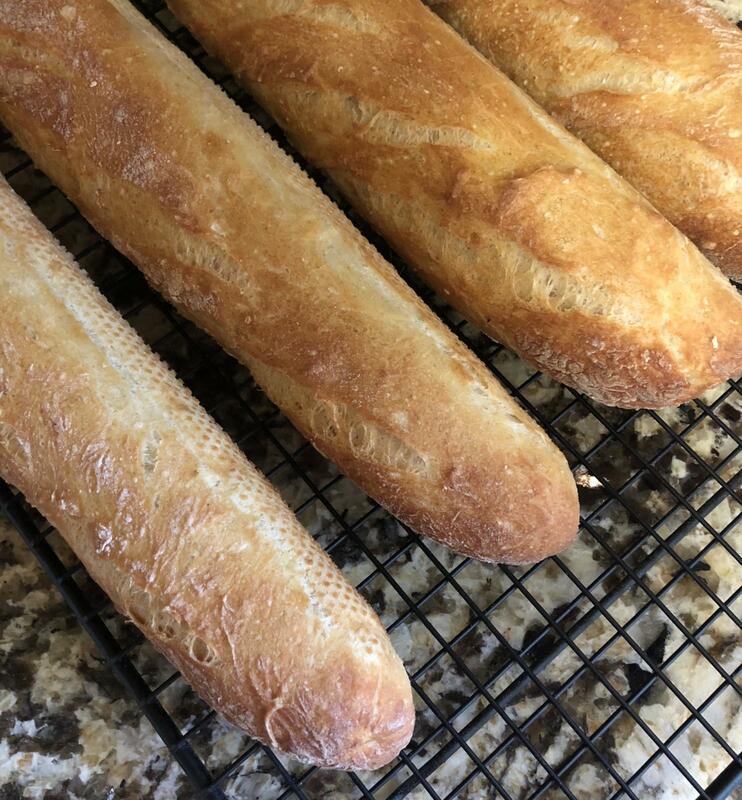 Maybe it's time for me to head over to txfarmer's post to try her 100% whole grain 36 hours baguettes? Really look forward to your next baguettes bake! Those baguettes look (and bet they tasted) great! I'm more interested in flavor than scoring perfection, and sometimes I do pretty good with the lame. A cold dough definitely helps (even in the freezer for 10 minutes to dry a little like someone here suggested). Happy 60th! Sounds like a nice celebration. I'll be joining that club myself in 2 weeks. My daughter's baby shower is that day, and the best birtday gift will be my first grandchild due 3 weeks later. Joyeux anniversaire à vous et à votre mari ! The outside looks good. I hope you channel your French heritage more with a second try complete with crumb shots. You look so youthful at 60. Nice to see you having a good time with friends and family.